﻿ Sun River Hotel, Da Nang | FROM $32 - SAVE ON AGODA! "Consistently good service, clean rooms." Have a question for Sun River Hotel? "The location is great and the neighborhood is nice to walk in." "Room was fine, bed was comfortable." 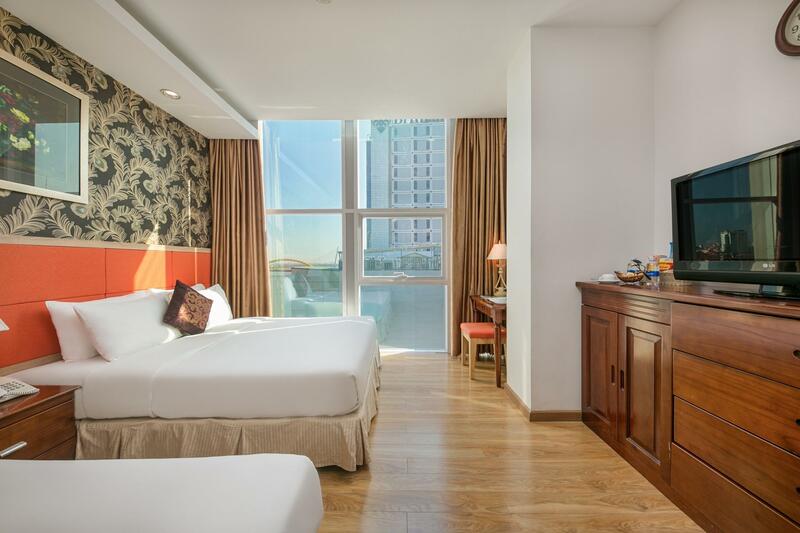 Located in Danang, Sun River Hotel is an attractive destination for local and international tourists. They also offer many picturesque locations such as Hai Van pass, Non Nuoc, Son Tra, Tien Sa, and Ba Na, making it an unforgettable visit for tourists. Situated in close proximity to the banks of Han River, a romantic place, it does provide a nice location. Featuring 50 bedrooms that are luxuriously designed, this three star property also offers modern amenities that fits the international standard. They boast facilities like cable television, ADSL, an IDD telephone, air conditioned rooms, a water heater, mini bar, Jacuzzi, modern bathroom amenities, and a hair dryer. 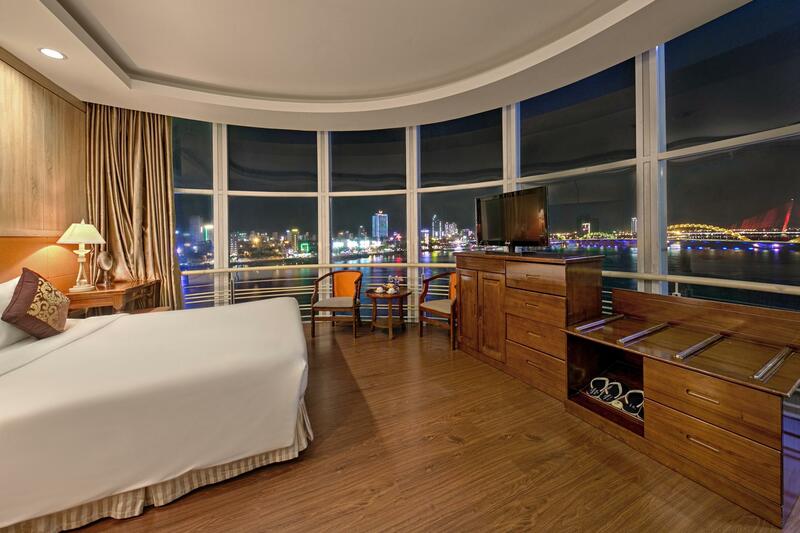 Apart from its modern amenities, certain rooms also feature beautiful views of the romantic Han River, Son Tra mountain, and Ngu Hanh Son tuft. Indeed, Sun River Hotel is an excellent choice of stay. One child under 5 years old stays for free if using baby cot/crib. 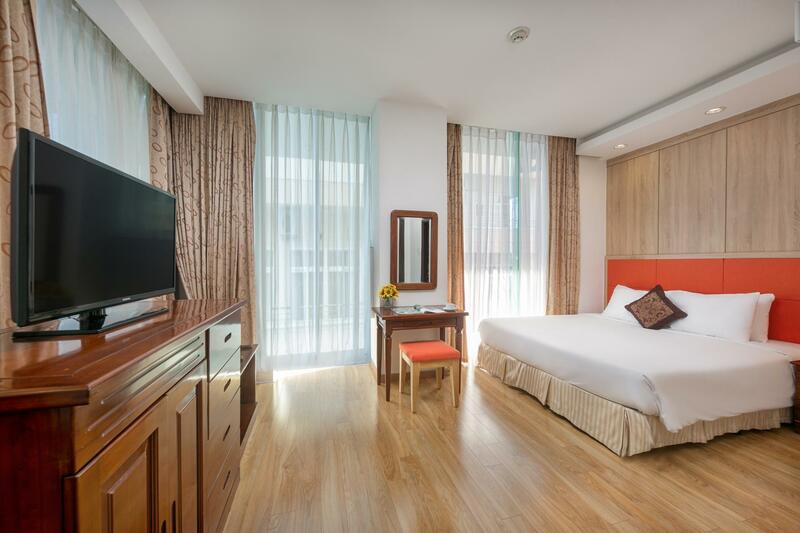 For guests with children, please note that the second child 5 years and over sharing the same room with parents will be charged VND 180,000 per night without extra bed provided. We booked a VIP 1 room, it said there is shower and bathtub in the bathroom, but the hotel said there is only shower when we arrived. The 180 degree river view is so beautiful as same as the photos, staff is very nice and the breakfast is delicious. Room was fine, bed was comfortable. breakfast was OK. But the building is old and it showed in some areas such as bathtub fit, windows closing all the way, AC in room etc. The location is great and the neighborhood is nice to walk in. Price is reasonable too. The staff were friendly and there seems to be some construction happening on one of the upper floors. The hotel is facing the Han River..we can see the dragon bridge from our window.Just 5 minutes walk to Han Market and a halal restaurant.Breakfast is quite okay but if they can put more pastries will be even better as the choice of halal food is quite limited.I will consider staying here again if I come to Danang in future. Hotel staff was helpful and friendly. This was a first time stay in Da Nang, so I have no idea about better locations, but this one worked fine for us. We had two delightful dinners in restaurants within two blocks of the hotel -- one Indian food and one Vietnamese. The A/C and wifi worked, two big points with us. Room was clean. As others might note in reviews, not all staff speaks great English -- but their English is routinely far better than my very limited Vietnamese (yes, no, please, thank you, good-by, hello) and using Google translate can break a communication logjam in an instant. I have stayed at Sun River Hotel before. The hotel has nice comfortable and clean rooms with good views of the riverside. I will stay here again next time I visit Da Nang. The breakfast chef makes a great omelette as well. Very clean,Good location just near Hang River,Good Breadfast with views on top floor.& Nice reception staff. Very nice stay for 3 nights,Visited BA NA HILL.Transpport arranged by Hotel staff & Cable car ticket 550000 Vietnam Don including Entrance to Ba Na Hill..Unespected Sinery/view of Ba Na Hill is nice & great.Temperature is about 19-22 degree. Dragon Bridge is just nearby with very nice night view.Hang Market is just nearby.Overall feel comfortable & satisfied to stay in this hotel.Worth to stay in this hotel & value for money. This hotel is well located and is in good shape. The rooms are mid size and the beds are good. Bathroom is clean and everything works well. Breakfast is fairly standard VN fare for this standard of hotel. Sited on the Han River. Nothing to either complain or get excited about. first time in danang, lucky to have made the right choice to stay. location, about 5mins walk to the dragon bridge. located next to the river and various restaurants right down the street. the han market is right behind. room was not spacious but still okie for max 2pax comfort. 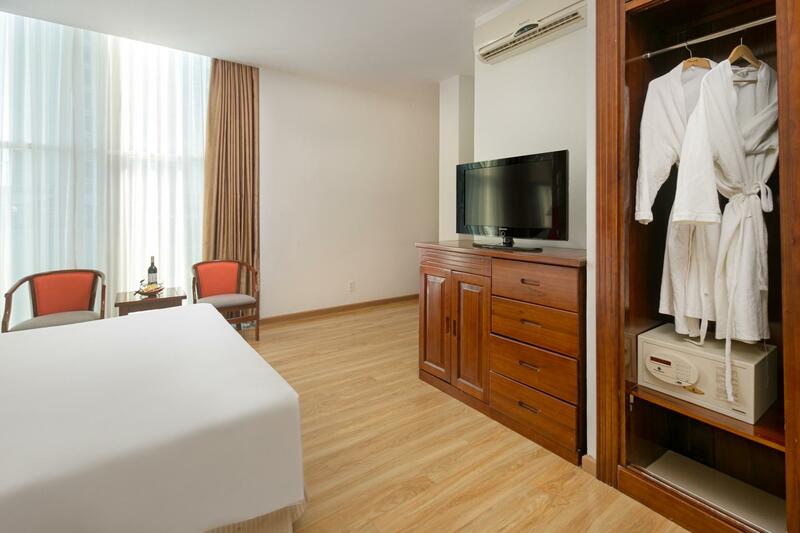 room safe provided with other amenities such as kettle, bathtub, working shower and free fast wifi. breakfast was complimentary with choices of local dishes to simple toast but sufficient for the morning. staffs were patient and helpful at the front reception, speaks quite good english. restaurant staffs are very helpful and polite. the hotel restaurant is located at the top of the building, able to see scenery across the river and the dragon bridge. the food served in the restaurant is tasty as well. i would recommend this hotel for budget travellers, families and business people. would definitely be back to this hotel on my next trip. I stay at this hotel 2 nights. The first night is not the river view, everything went well. The hotel picked me up from the airport (around $12). The hotel is just no more than 10 minutes from the airport. You will even feel that it is too near that you can walk by yourself (but dont do that). And the location is just right at the center of this riverside city, Danang. I stay at this hotel 2 nights. The first night is not the river view, everything went well. The hotel picked me up from the airport (around $12). The hotel is just no more than 10 minutes from the airport. You will even feel that it is too near that you can walk by yourself (but dont do that). And the location is just right at the center of this riverside city, Danang. My second night, I moved to the room that has river view. 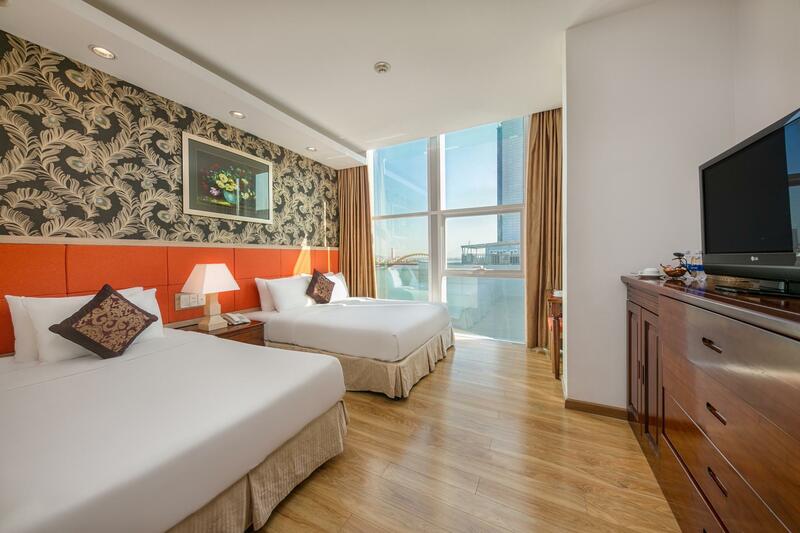 The room was luxuriously decorated, and almost panoramic view of the city and river view. 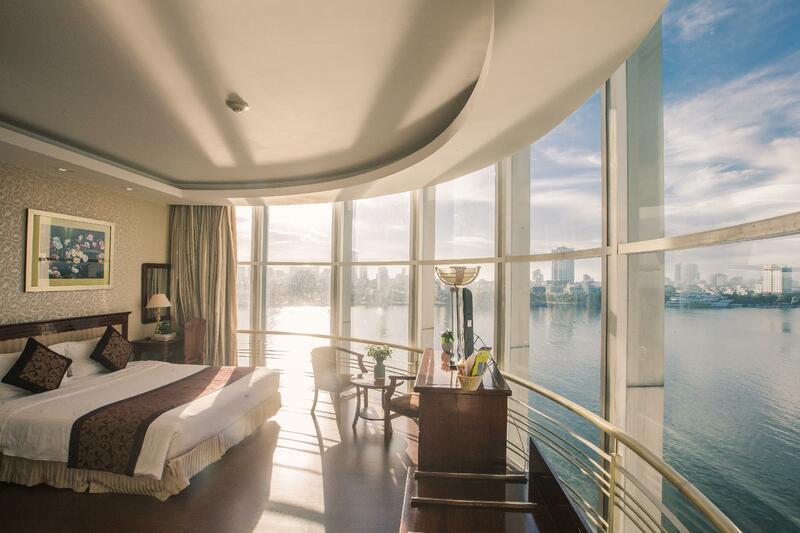 It is a clear big glass window with long curtain that makes you be able to enjoy the spectacular view of Danang. The bathroom is an electronic sauna box, very fun. The breakfast is quite ok, more with local specialties. In conclude, recommended! This hotel is really nice. A good location right on the river, everything you could need is a short walk away. Vinh Trung Plaza is just a 1 USD cab ride away though walkable if you can stand the heat. It is modern hotel. Very clean. Great internet connection,which is important because I work online. Delicious buffet breakfast in the morning with a wide variety of food to choose from. The staff is very friendly. Very comfortable beds and good A/C. I would definitely stay here again. Just in front of the river with fantastic view. We stayed for one night only and it was our last night in Danang. We tried to get a Chinese food and with the help of the hotel staff, they recommeded Kim Do restaurant just 5 minutes walk. The food was OK, price was at the higher end side. They also serve roasted suckling pig, just FYI. it was only one night stay, we reached there almost 9pm. 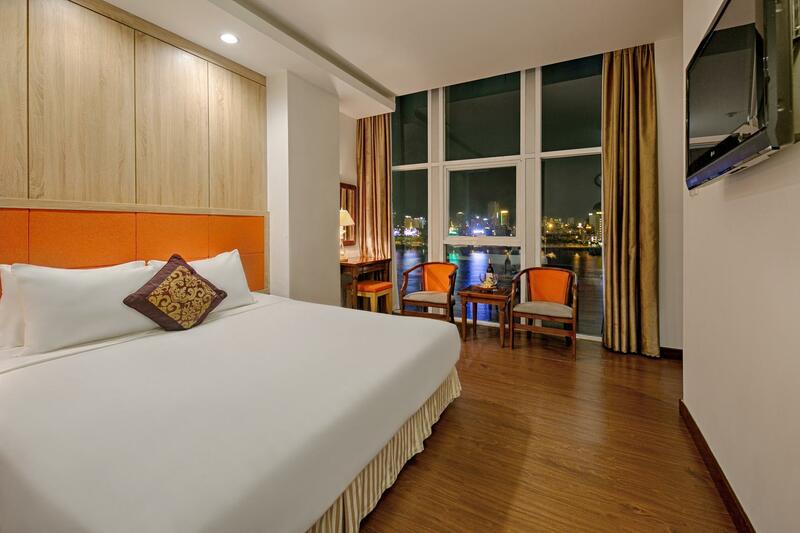 the hotel is situated middle of danang town with a nice river view. we can find food nearly the hotel easily. taxis are ready and standby in font of the hotel in case you want to go for shopping and sightseeing. btw, the airport is just 10 mins away, so do not need to worry about rushing to the airport. This hotel is very new and all its facilities is still very new which is good. Nice room with clean bed and toilet. The view from room is looking at the Han River which is great and try to get high floor. The breakfast is much better than we expected and the staff are extremely helpful. At night we can take a nice stroll along the Han River and 5 mins to the shopping mall. However, the wifi is not so stable ..this is due to Danang area. Stayed at the Sun River Hotel for a business trip and found it to be generally comfortable and worth being looked at again. The staff is helpful and accomodating if we can get passed the communication issue with some. The VIP 1 room was clean and comfortable with excellent view of the Han River. The food wasn't all that impressive although a variety of items may be found for the Asian taste. Near the hotel, some restaurants offer variety of cuisines and within walking distance. Nice TV program and breakfast. this is a nice hotel to stay. very near to the market and shops. just step out you can enjoy the river view.the hotel tv program very suitable to my kids, disney channels. air condition is cold and got a bath tub. very clean environment. breakfast is nice too. we also able to walk to the restaurant nearby. 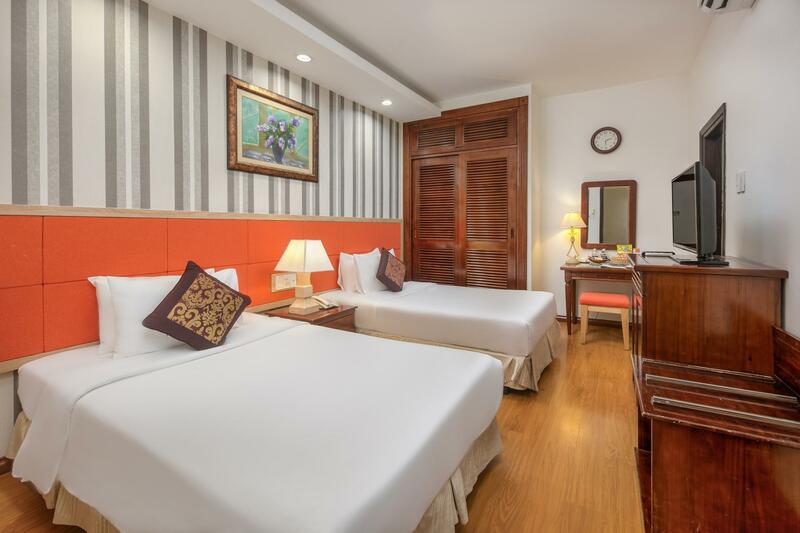 the rooms are well decorated.the housekeeping was good.the staffs are friendly.the breakfast good.the hotel located at the city centre and in front of the river waterfront.it also located just beside the market.no problem in finding place to eat.great place to do shoping at danang,especially clothing or fabrics. clean & modern room in the city. im staying in vip 1 room. night i can see the han river view from my room. if want to go to the beach will need take around 10-15min by taxi and go to hoi an around 25km & go to hue will around 110km++. from the hotel you may walk around 15-20min to cham museum & 30-40min to shopping complex (big c). i'll stay here again if i go to danang next time.